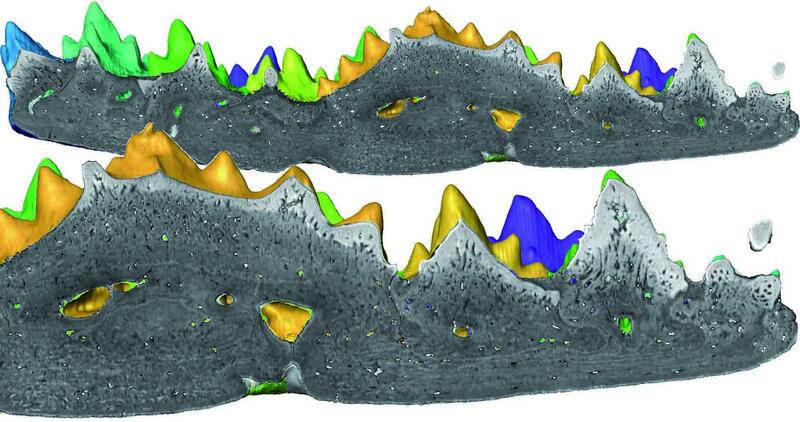 ​Are these the world's first teeth? We take chewing for granted, but if you trace evolution back far enough, you're bound to stumble on time before teeth. Now, researchers from the Netherlands and the U.K. have found what may be the earliest known example of chompers, in a 410-million-year-old fish. "Our results suggest that teeth originated deeper in the tree of life than we thought," said Martin Rücklin of Naturalis Biodiversity Center in Leiden, lead author of a study published Wednesday in the journal Biology Letters. Observing the artifact, the researchers determined it was the roof of a mouth and that it was covered in many small but surprisingly complex teeth. They surmised the fish likely swam near the surface of the water, catching and crushing prey as it went. Rücklin and Donoghue took thousands of 3D X-rays of the teeth and identified a central "pioneer" tooth around which the rest of the teeth grew, extending out in successive concentric circles. Their analysis also showed that the teeth were composed of the same basic elements of human teeth -- enamel covering a core of dentine -- and that they were structured like the scales on primitive fish. According to the researchers, this provides strong evidence that teeth -- even our very own molars and incisors -- evolved originally from scales.